ISO 13849-1 is the most important standard for regulating the basic principles and performance required of a safety control system for machines and devices. This standard was greatly revised almost 10 years ago in November 2006. 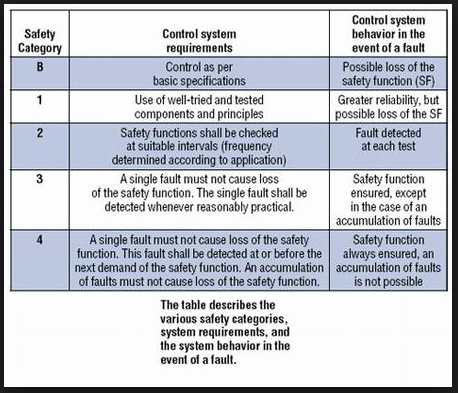 The 2006 revision highlighted changes to the fundamentals of system design in manufacturing safety. A major update overhauled the use of Performance Levels when performing risk assessments of machine design and use. Performance Levels (PL) are not just extra boxes to check off on the paperwork, but make a difference in real-world safety when operators and designers work together. Benefits for Users: Machine users can easily describe the required performance without having to really design the equipment themselves. By using a common, easy-to-understand set of standards that are shared with the machine designers and manufacturers a common goal of safe machine design and use can be met much easier. By taking into consideration factors such as minor damage (S1), which is often forgotten or underestimated, the frequency (F) and possibility of avoiding the hazard (P), the accuracy of risk quantification has been increased. These factors all go into determining your Required Performance Level or PLr. Benefits for Machine Designers: With the availability of safety products today in the control systems architecture and components reliability it has created more flexibility for machine designers to implement safety into their machines. The revised ISO13849-1 standard allows users to select a combination of parameters to come up with their Required Performance Level (PLr). Since achieving a certain PLr can be achieved by a variety of methods the machine designer can choose to give priority to component reliability in designing a system in which the safety function operates frequently (such as with a power press machine), or to give priority to architecture for a system in which the safety function only operates occasionally (like a robotic work cell). Four parameters are used to evaluate a control system’s performance level in manufacturing safety. MTTFd refers to an average life before the dangerous failure of a component occurs. DC refers to the certainty of detecting failures in the entire system (including software). CCF refers to the protection of the entire system from failing due to a common cause. As parameters for reliability, MTTFd and DCavg are determined by formulas, and CCF is determined with a checklist method. Each of the parameters is classified into levels using standard values: three levels for MTTFd, three levels for DC and two levels for CCF. Performance Levels are evaluated comprehensively in terms of these four parameters. In future articles we will focus on each of these parameters in more detail… STAY TUNED! In the meantime, the knowledgeable staff here at ACD can answer any questions you may have about Performance Levels or manufacturing safety products & procedures, or assist you with industrial electrical supplies. Find out how ACD earned its reputation for unbeatable customer service with engineering support.